Framework will include ground floor retail space, 5 floors of office space and 5 floors of affordable housing. The Oregonian took a look at the transformation planned for the Lloyd Center and surrounding blocks, including the NE Multnomah Plaza, West Anchor Remodel, East Anchor Remodel, 1400 NE Multnomah and 1510 NE Multnomah. New design guidelines for the New Chinatown Japantown Historic District will go in front of City Council for approval later this year. The DJC looked at how the guidelines aim to preserve a Chinatown that is unlike others*. An appeal of the Historic Landmarks Commission’s approval of Pearl East will go before City Council on Wednesday, reports the NW Examiner. The approval is being challenged by a neighbor who believes the building is too tall for the NW 13th Avenue Historic District. Jordan Schnitzer will give PSU $5 million to open an art museum in Neuberger Hall, reports the Oregonian. A building permit is ready to issue for Framework, reports Dezeen. 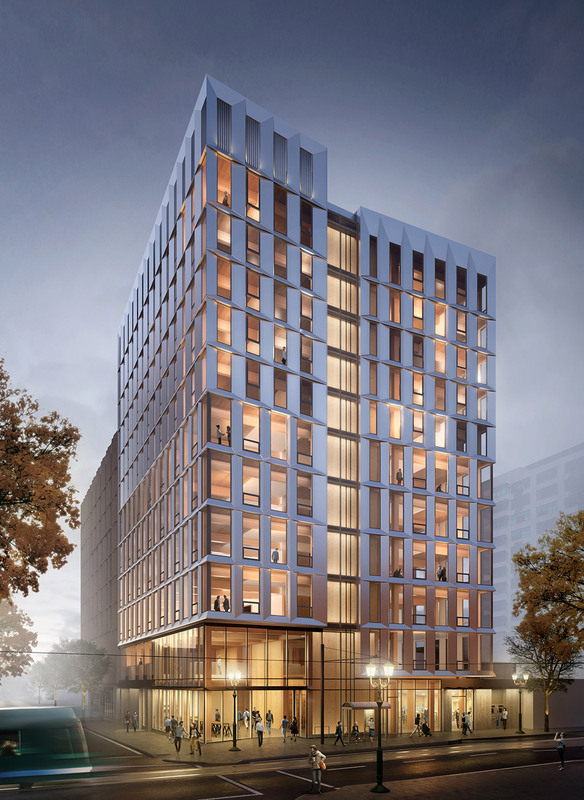 The Pearl District tower will be the tallest timber high rise in the USA when it is completed. The Oregon Convention Center is planning a renovation that will complement the Convention Center Hotel, according to the Business Tribune. Work will include a major remodel of the existing plaza at NE Holladay and MLK. Construction on the Hyatt Regency branded hotel is expected to start this summer. This entry was posted in 1400 NE Multnomah, 1510 NE Multnomah, Framework (Pearl), Lloyd Center Remodel, Lloyd East Anchor Remodel, Lloyd West Anchor Remodel, Pearl Building East, PSU Neuberger Hall Renovation, weekly roundup. Bookmark the permalink.